I know that our next sponsor needs no introduction, but nonetheless I want to formally welcome Erin from The Vintage Pearl to the House! From impeccably detailed necklace charms and stamped bracelets to classy pearl earrings and rings, The Vintage Pearl has pretty much covered it all. Erin can feature a favorite saying, important date or loved ones initial on almost all of her customizable hand stamped pieces. Any of these fabulous items, in all different styles and price points would make excellent, personal Christmas or birthday gifts for the Mom, Grandma, Daughter or special guy in your life. Just added to Erin's shop is one of The Vintage Pearl's newest creations, the Golden Heart necklace. To celebrate the The Vintage Pearl as one of our fabulous new sponsors, Erin is graciously offering TWO $50.00 gift certificates to a couple of lucky House of Smiths readers, this week! 1. Visit The Vintage Pearl shop, pick out one of your favorite pieces and then come back and leave a comment letting us know which one you would love to have! 2. Head on over to "like" The Vintage Pearl on Facebook, come back and let me know you've done so for an extra entry. Please remember to leave a way for me to contact you, if you are the winner. Thanks! I adore the Nana has our heart keychain. Everything in her shop is so cute! Loved -- The Vintage Pearl on Facebook -- so fun! I made sure to "like" Vintage Pearl on Facebook. I loved all of them! I think my favorite is the flower and circle necklace. Not sure if I'm done having babies so I could always add more to it! (rachel.tant@gmail.com) And I "liked" it on FB! I bought a stamped bracelet off of etsy.com before I saw the vintage pearl! I'll make sure to buy my next one from her!! I like the dainty drop necklace... I would love to have my grandmother's name & birthstone on it... she passed away last year and we share the same 1st name! I also liked vintage pearl on facebook! Love the Vintage Rectangle Initials necklace!! I love the necklace in the middle on the home page. It would be the perfect gift for my daughter and for her little in her sorority. Their symbols are the heart and the dove and their stone is the pearl so a necklace with their initials on heart charms, a pearl charm and a charm with a dove would be a wonderful keepsake of this fun time in their lives. I love Erin's creations. I have a necklace with mine and my husband's names stamped on circles. I'd love to have the bird's nest necklace. I follow both of you. My favorite piece is the "Our Family Nest". Love it!!! I like her on Facebook and twitter. Thank you. I like the Vintage Pearl on Facebook. What a great site! It's hard to pick from ALL of the amazing products. However, I do love their new golden heart necklace. I also think the chunky spinner ring is so fun and unique! Oh I would love to have the layered mother of pearl with the two layered discs and the mother of pearl in the center. love love love. I love the thick and thin leather bracelets are beautiful. With our friends adopting, and struggling with the wait, I would love to gift them each a bracelet with 1 Samuel 1:27! i love the circle of love necklace!!! I'm in LOVE with the dainty drops lecklace. Thanks for the chance at this fabulous giveaway! I would get the chunky love necklace! Really digging the leather cuffs!! I would love the rectangle names on a chain. So I can put all my kid's names on a necklace! I love this site! Love the wide cuff band for men~ I would love to get my five boys one with one of my fav scriptures on it for them. Liked Vintage pearl on face book. I like their spinner rings. I really like the monogram necklace! Thanks for the giveaway! I like the heart to heart ring. Thank you for the giveaway. Oooh, I really like the new golden heart necklace! I LOVE the nest egg necklace! I've been eyeing one for a long time now. I would LOVE to win! I want to get the Vintage Lovebirds Necklace! I also liked them on Facebook! I would love to have the cranberry double drop pearl earrings! So perfect with the holidays approaching. I would love to have the dainty names nacklace!!! Love the circle of love simple necklace! I liked The vintage Pearl on FB!!! I "liked" the Vintage Pearl on facebook. I LOVE The Vintage Pearl! I have been drooling over the 'our family nest' piece! gorgeous!! I love the circle of love bracelet. Too cute! I love the thin leather cuff! I "liked" the vintage pearl on facebook! I love their vintage collection! Especially the vintage rectangle initials! I like the initial on a chain necklace! I like TVP on FB! I LOVE the dainty drops necklace, in fact i have one and it's my favorite necklace to wear. I wear it nearly every day! I would choose the Chunky Love necklace if I won! I love it! I like the Vintage Pearl on FB! i love the golden heart necklace! its going on my christmas list for sure. thanks for the giveaway! I'd love to give a personalized baby spoon for a new baby gift! Sweet giveaway! I love the "Heart on My Wrist" bracelet. I'd have it stamped with, "To Thine Own Self Be True." SUPER excited about these gift cards!! I like the key to my heart necklace - so pretty! I love everything in her shop but my absolute favorite is : Faith and Fortune Cookie Necklace. You need both to get through this crazy life!!! P.S. i LIKED it on facebook too! 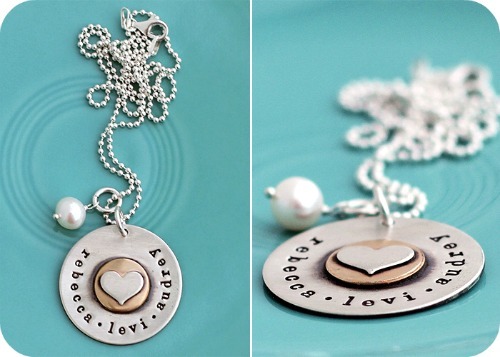 I really want the Mother of Pearl necklace with my kiddos names on it!!! I "like" The Vintage Pearl on FB!!! LOVE everything and I think I know where i will be doing my Christmas shopping :) I like the chunky spinner ring!!! Pick me please. courtneybeld@yahoo.com Thanks for sharing such a great site! ...i just liked them on facebook!!!! LOVE it all, my favorite is the chunky spinner ring. Copper and sterling mixed and hammered!! I think i know where i will be doing all of my Christmas shopping :) I also liked them on facebook...for sure!!! Pick me please, courtneybeld@yahoo.com !!!!!! LOVE the baby spoons! Are you kidding me? They are the most precious things ever! Simple and understated. I'd totally frame one for each of my friends having babies soon! LOVE the secret message ring! I love their stuff! I got a necklace from my husband with my daughter's name on it. It is one of my favorite most treasured pieces! I would love anything but I'm partial to the dainty layers necklace. I've liked the Vintage Pearl on Facebook. LOVING those dog tag initials OR the vintage rectangle initials! I own several TVP items and would love to add to the collection! Thanks for the chance to win! I just finished liking Vintage Pearl on FB. With so many beautiful pieces it was hard to choose a favorite from the Vintage Pearl collection, but I'd have to say the "vintage silver charms necklace" was my favorite. I would love to get the sterling silver cuff. This is a fabulous giveaway! The Vintage Pearl has such beautiful stuff. I would love to have the vintage baby feet with my son's name. Just went over to Facebook and liked The Vintage Pearl. Love the vintage paw print necklace and vintage cross necklace! "LIKED" the vintage pearl on FB!! :) Thanks for the great giveaway! I LOVE the rectangle names on a chain necklace but I also love so many more of her items! I liked The Vintage Pearl on FB. I would love to have the simple "I love you" necklace. So sweet! I just "liked" over on Facebook! I love the dainty drops necklace. Thanks for a chance to win!! I really like the layered circle of love and the names on a ring. oops I liked them on facebook!! !I said I liked the Love Link Bracelet!!! I love The Vintage Pearl! I've had my eye on the "Our Nest Necklace" for a while. I liked them over on Facebook and shared their giveaway link on my page. My email is Delitful57@yahoo.com. "our family nest" is super cute! I love "square and circle layers"!!!! I love the bird nest necklace! Following The Vintage Pearl on Facebook! Yay! I love the vintage silver charms necklace! So pretty! I like The Vintage Pearl on FB!! My FAVE from The Vintage Pearl is the Cup of Love. I'm hinting at my hubby to get me one for Christmas with our daughter's name. The Vintage Pearl is GREAT and I have always admired the Family Tree necklace. Beautiful! The nest necklace as been one of my favorites for awhile. I "like" The Vintage Pearl on FB!! I love the you are my sunshine necklace!! I love the 'initial on a chain'! I love the free bird necklace! I am digging the key to my heart necklace. I have been liking the skeleton keys lately, and I would love to win it for my mom for Christmas. Since I'm already blessed enough to own her square initials on a chain, I would love love love the super cute riveted keychain! I liked The Vintage Pearl on Facebook!! I LOVE the new Golden Heart necklace! I LOVE the Eclectic Charm bracelet!!! I am a mom of one and expecting another so I love that I will be able to add as many charms as I like to this darling and stylish bracelet!! I really hope I win! I didn't know they had a facebook page!! I am so glad I read this! I just liked them!! I love her things! I recently received a bracelet from the vintage pearl and would love a necklace to go with it! oh and the gold heart necklace is gorgeous! I liked TVP on facebook! My favorite is the Dainty Layered Hearts - love them!!! Everything is beautiful! I especially love the golden heart necklace! I love all the jewelry. This is my one of my favorites http://www.thevintagepearl.com/products/vintagesilvercharmsnecklace_p115. So many pieces to pick from.... I would love the baby spoon-keepsake for my daughter. love the secret message ring! thanks for the giveaway! i LIKE the vintage pearl on FB! thanks for the giveaway! I already have the flower and circle necklace, but I also love the mama bird and the messy nest necklace. I have wanted something from their website for forever. If I had to choose I would pick the I love You to the moon and back, because that is what I say to my husband and son all the time. I also went to their facebook page and clicked like. I "Like" Vintage Pearl on FB now! LOVE the Key to My Heart Necklace!! I'm a fan on FB of TVP! I would love the square names on a chain. We just lost our baby at 30 weeks (2 weeks ago) and this is the 2nd baby we've lost (last one at 28 weeks). This would be so nice to have in memory of the two boys. I would love to have the bitty blossoms necklace! So cute! I am having my first baby in March and would love to have his initial on a necklace! I would do the the square initial on a chain! I also liked it on face book. And I love the dainty drops necklace whith the names of my kids! Love the stamped heart charms! I love the pearl cluster earrings and the pearl nest ring. I love the vintage silver charms necklace! I love the anti necklace. I also "liked" the Vintage Pearl of Facebook! 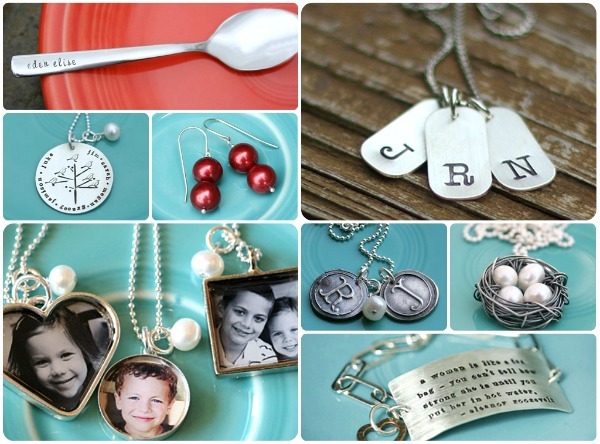 I've always wanted something with my kids & hubby's initials...all of them are gorgeous! I love the dog tag necklaces, so cute! Love the handstamped keychain!! Love the Vintage Pearl!! I also liked it on facebook!! I love the Pearl Bracelet with a Charm- gorgeous! I like Vintage Pearl on Facebook! I want the open circle necklace. BEAUTIFUL stuff. I've been in love with the Bitty Blossoms necklace forever!! Thanks for the giveaway!! My first grandchild was just born a few weeks ago and I can see me adding initials to it in the future! I would love to add the thin leather cuff to my TVP collection! I love the messy nest necklace! I also liked on FB! Thanks!! i like the circle of love necklace! I'm having baby #4 and need a new necklace with my kids names. I like the square with names or the names around the fused heart.